I love spring time. I think I’ve only said that about a million times. But it is still true. Even rainy Sunday afternoons, because I know that everything will be greener when the rain stops. Some of my flowers are blooming, I have tulips that are bright and beautiful and a couple little flowers here and there, and a lot of things coming up and looking ready to take on the year again. My husband rototilled the garden yesterday, or as the boys call it “used the rollertator”. I need to get my walls of water up in the next week or so so that everything is ready to go when I plant over Mother’s Day weekend. I have two roses that are not looking too hot though. All the others have beginning growth on them and these two have nothing. I need to get some rose food and see if that makes any difference and if not, then I will have to replace them. I’m disappointed, it’s the first time I’ve lost some roses. 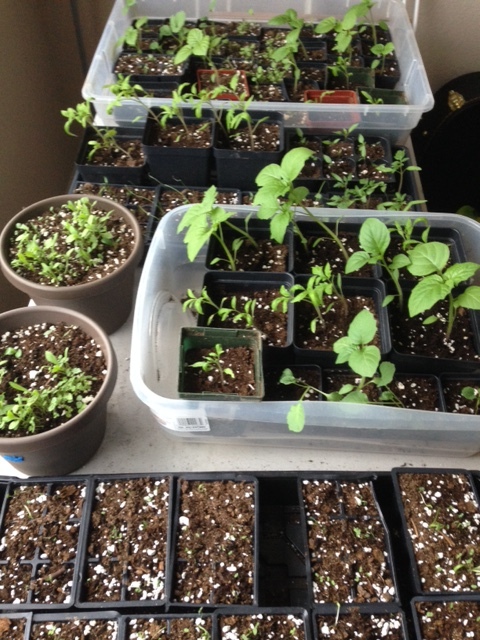 And my sprouts are doing good. Except for the peppers, which never came up. The tomatoes and tomatillos are going to town. I may end up having to buy some pepper plants from the local nursery. Oh well.